Our Kihei Maui condo offers all the comforts of home in a peaceful garden style setting. It is just steps from the beautiful Kamaole 1 beach park and a couple minute drive / bus ride to some of Hawaii’s finest golf and shopping. Ocean views and evening sunsets from the condo grounds are stunning while breakfast on the lanai offers a tranquil retreat with singing birds and open greenery. 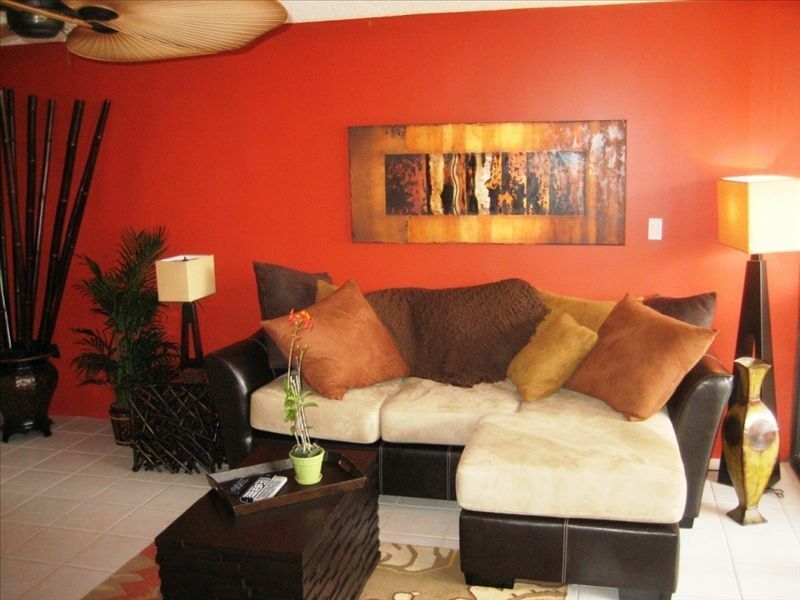 The condo has 1 bedroom, 1 bathroom and an expansive lanai. The living and dining areas are spacious and comfortably furnished, perfect for curling up with a good book or daydreaming as a gentle ocean breeze dances by the lanai. For added enjoyment we have also included a 37” flat panel TV, Apple TV, CD Player/IPOD dock and wireless high speed internet connection. A furnished lanai attached to the living room is perfect for a relaxing breakfast or an intimate dinner in the evening twilight. There is one fully furnished bedroom with an exquisite king size bedroom set. A bright, clean shower room sits in a separate room directly adjacent. Additional sleeping space can be found by way of a modern queen sized sofa bed in the living area. Traveling with kids? We have all you need for your stay. Pack and play, toys etc. Send us a note and we can discuss your needs and what we have available at no extra cost. The kitchen is well equipped, including a large refrigerator, electric range and oven, microwave oven, toaster, blender, dishwasher, coffee maker and coffee grinder, pots and pans, tableware and cutlery, and washer/dryer. A 'lanai' is an open-sided patio, ideal for relaxing over a morning cup of coffee or an evening cocktail. Savour the sunset and your meals outdoor on 2 large ‘rocking-loungers’ and/or a dining table with 4 chairs. There is one large out door swimming pool and hot tub located in the sunny center court of the complex. 2 full size tennis courts (private for building guests) are also available near the rear of the complex. Gas BBQs and common seating areas are located adjacent to the tennis courts and pool deck. Being a passionate surfer and having visited Maui on a number of occasions, I just had to set up a cozy base in South Kihei. My wife and I and our two little girls have made many wonderful memories here and are honoured to share our special condo experience. Maui is hands down one of the most beautiful islands in the world - you just can't beat it! Located within the Kihei Alii Kai development, the Condo is just steps away from some of Maui's finest beaches, surfing, snorkeling, restaurants, and shops. A 5 minute drive or bus ride leads you to 4 of the island’s top rated golf destinations – including the Wailea Blue, Gold and Emerald championship courses. All this amidst stunning ocean views and breathtaking sunsets makes for an unforgettable vacation experience. Stayed for 9 nights and loved our time. We had never spent too much time in Kihei (we used to live on Maui in Napili), but the sunny days were great without any rain or clouds at all while we were there. There was shopping and restaurants and grocery/natural food stores within walking distance. Condo was stocked with any kitchen item that you might need as well as beach equipment, beach towels, and beach toys. Condo was clean with nice decor and we loved the outside lanai seating. Very quiet condo and the bed was super comfy - we were in bed by 9 many nights but then up early the next morning. I would highly recommend this condo. Also Trevor and Kathryn were very easy to contact with questions and always helpful. Reasonable pricing as well. Pleasure to have you and so glad you were able to relax and enjoy Maui! We hope to have you back at our home away from home. Great location access to an amazing beach& little shops and restaurants. We enjoyed our stay very much the property was clean and had everything we needed and more. You can walk to the beach and to coffee shop, bakery, market. We will definitely. go back again. Loved it. Thank you Kathryn and Trever. The unit was spotless, well equipped, comfortable and VERY quiet, even with some fairly raucous neighbors. Furnishings were in excellent repair and comfortable. We stupidly failed to print the email containing the lock-box code and had to call the owners late at night (for them) and they graciously provided the information, even though we woke them up. We would certainly consider staying here again. It was reasonably priced in an area with all needed services i and good restaurants. best snorkeling across the street. 1 br condo, king bed and couch sectional (converts) that’s really comfy. The condo basically had everything you’ll need for the stay. Like a hotel stay without the expensive price. Private and quiet. Close by to all the best shops and food. Rent snorkel gear for the week at the snorkel store. Pleasure to have you as guests, we hope to have you back. This has got to be there best location in Kihei/Kamaole beach area. Even better, the apartment feels like a premium resort villa in every way. Private quiet shaded lanai that walks straight out to the beach a few hundred feet away. Several top notch restaurants right on the block. This beach has the best sand/water clarity/palm trees/views/temp/waves balance of any of the dozen or so we visited, so by the end of the trip we didn't even want to leave our beach and apartment. However it is very central (for Kihei) and a close car ride to anything you need. The apartment is luxurious, dead quiet, and very well stocked, with every detail accounted for (especially great AC). Furthermore, the preparedness and professionalism shown by the owners was truly elite. Highly recommend to anyone ! Trev's Surfside Hideaway was exactly what we hoped for. The condo was clean, well-stocked, and great for our family of 3. Its main floor location was private, but still only steps from the pool. Everything that we needed for the beach was there waiting for us. The location was perfect - steps from a small mall with restaurants, a coffee shop, gelato, shaved ice, and gift shops. Kamaole Beach 1 was just across the street from that. Kathryn gave thorough instructions about everything that we needed to know which made for a very relaxing vacation. I would highly recommend Trev's Surfside Hideaway and can't wait to go back again!